Missy, aka Mulberry Sable, is a beautiful, white and brindle, 16-month-old female, born July 9, 2006. Her sire is Mulberry Memory and her dam is Global Statement. GALT was contacted saying this was a special girl, asking if we could take her. After getting her, we know what "special" means. Missy is a very, very sweet girl. Missy is extremely shy, and it is going to take quite awhile for her to come around. She is making some improvement but still runs and hides whenever you go toward her. She does love being loved on once you get close to her. 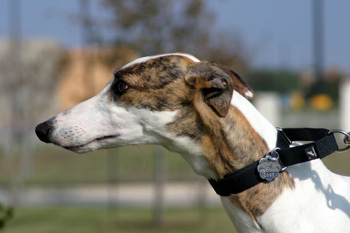 She is in a foster home with several other greyhounds, and this will help train her. She will follow the other dogs' lead. Unfortunately (for the cat) Missy did not pass her cat test. These are the comments from her short stay in a home with cats: Well, we gave Missy plenty of opportunity to NOT chase the kitties, and she just got more and more interested and brave in her chasing. Even with Molly holding her ground and hissing at her she kept on coming. Molly has learned as long as the muzzle is on them, they can't really get her, so she just sits and holds her ground and growls and hisses. But that did not deter little Missy at all after the first couple of times. In addition, even when the cats were not in sight she continued to look for them. So, Missy is not cat trainable. 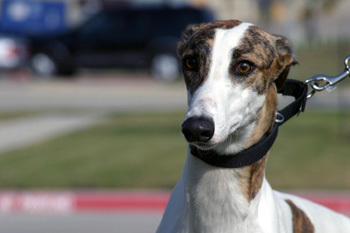 Missy is a small, picture-perfect greyhound with a personality to match. At first Missy is shy and fearful, preferring to approach rather than being approached, and in situations where she feels uncertain or frightened it is better not to chase her. She may need her crate for a while and should be crated when left on her own. But as she becomes more comfortable and familiar with her surroundings and expectations, a completely new persona begins to emerge. This little white-and-brindle girl is a bundle of puppy energy and playfulness. Extremely smart, she learns from watching the other dogs and from calm correction. She is a "me-first" kind of girl and will need to be with other dogs who either don't have to be first or who will gently let her know her place. She is learning that cruising the counters and snatching food from the other dogs is not acceptable. She will need to eat in the crate (which she is accustomed to doing and puts herself in at mealtime) or be monitored until everyone else is finished. She is highly food-motivated. A very talkative girl, she lets it be known when it's time to eat, time to go out, time to get attention. Unlike most greyhounds, she is somewhat of a watch dog, although barking decreases as she becomes used to sounds and activities. Missy is accustomed to a doggie door (which she learned to use all by herself in one day of watching the other dogs) but will adjust to being let out on a schedule. She is very affectionate and loves attention. Going for a walk is a highlight of the day and she gets very excited when she sees the leash, but she is learning to be quite mannerly once the leash is on. She loves squeaky (or not) stuffies and can be somewhat selfish sometimes. If quarreling begins, the stuffy disappears. Although she would love an invitation on the bed, she sleeps on her dog bed in the bedroom (she doesn't really like sleeping in the crate) and hasn't invited herself onto the furniture. She gets along well with the other greyhounds in her foster home. Missy loves to sleep close to and cuddle with the other Greyhounds, especially Hugo, her foster brother. (They would make a good pair). Missy will need patience and training as she still is somewhat of a puppy, but she is a smart, fun-loving, affectionate and charming little girl. 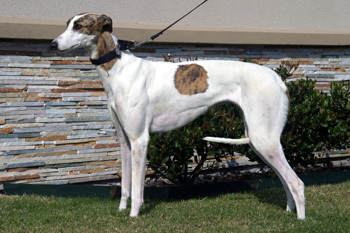 She will thrive in a calm, routine-oriented environment where she has outlets for her energy, a Greyhound buddy to play with, and lots of love and guidance from her humans.